This is a unique mosaic which I made as an entry for an online competition calling for an artwork using text! 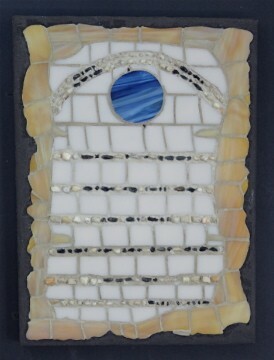 Morse Code in an artwork might only appeal to a ham radio junkie but it works for the intent of the mosaic! This is a 'conceptual work’ in that there are many notions in it: the top line in code states, "CQ CQ" shorthand for an operator asking "is anyone listening? "; the five lines below are the English saying: "keep strong and carry on"; in the bottom right corner is my first name; the planet Earth turning on its axis pushes you to consider the state of our mother planet; the yellowing, tattered "poster" background is, to me, post-Apocalyptic looking, and the actual dots, dashes and spaces are black and white pebbles—the ground under our feet. It’s a call to all of us, the Universe, to save us from ourselves.